In case you hadn’t already noticed, sportswear is having a moment. Gone are the days where gym kit consisted of your ex’s baggy T-shirt and that pair of faded tracksuit bottoms you also wear to do the housework in. 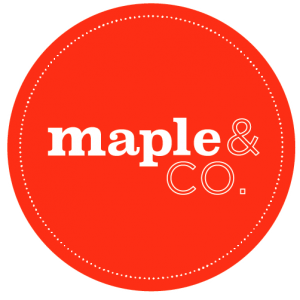 Both luxury and high street brands like Lululemon (a favourite of ours here at Maple & Fitz!) are now offering fun, fashionable and fabulous gear to get you looking (and thus FEELING!) great. While in the gym, at the spinning studio (Psycle of course) or on the yoga mat, and then wherever you head afterwards, be it brunch with the boys or a stretch and a green smoothie with the girls! Lululemon produce stylish workout clothing for men and women, which is both comfortable and flattering. Rain or shine, you will almost always find Steph, Jodi, Rox or me in a pair of Lulu pants, whether at home, at work or working out; we even occasionally wear them out to dinner – they really are a multi-functioning dream! But Lulu offers a lot more than just beautiful clothes. When you have a lot going on from Monday to Friday, it’s all too easy to spend your precious time off at the weekend doing necessary (but mundane!) chores and not actually taking some time out for yourself. Recently we were at our local Lululemon store, Marylebone, for yoga for special children and before that we were at the King’s Road store with Emma Peel leading the class. Fuelled up by one of our raw balls, we spend our Sunday mornings perfecting our downward dogs, feeling part of the local community and relishing in the (free!) opportunity to take care of our bodies, whilst enjoying the chance to meet new people in a more relaxed environment than our hectic weekday life! Although you may think the idea of jumping out of bed before midday on a Sunday doesn’t sound appealing, starting the day with an energising yoga class means you’re done by 11.30 and the rest of Sunday is yours to enjoy. Additionally, a morning hit of endorphins always means you are more productive afterwards, so you can still accomplish those boring tasks on my to-do list, but in less time! With their wonderful and varied store locations, attending a Lululemon class also enables you to get to know different neighbourhoods around London that you wouldn’t usually visit. You can find all the information about what’s going on in each store on the Lululemon UK website, so what are you waiting for? Throw on a pair of gorgeous yoga pants and seize that (Sun)day! Next Post What makes a grain ‘ancient’ and how to use them (recipes below)?